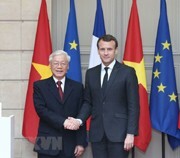 A number of trade deals between Vietnamese and French businesses were inked on March 27, paving the way for further economic and trade cooperation between the two nations in the upcoming time. A number of deals were signed under the witness of Party General Secretary Nguyen Phu Trong after his meeting with representatives from the Movement of the Enterprises of France (MEDEF). At the headquarters of the Movement of the Enterprises of France, Vietnamese airline Vietjet and French group Safran – CFM signed a memorandum of understanding (MoU) on comprehensive cooperation in providing engines and technical and maintenance services worth US$6.5 billion for Vietjet airplanes. Other cooperation documents included a contract between Vietjet and Gecas France on buying six A321 neo airplanes worth US$800 million on hire-purchase, an MoU between FPT and Airbus on building capacity and consulting staff and developing the Skywise data platform of Airbus, an MoU between FPT and Geopost on helping to modernize the IT system and improving the operation efficiency of Geopost. Following their talks between Party Chief Trong and French President Emmanuel Macron, the leaders witnessed the signing of a number of cooperation agreements. A MoU was also signed by Viet Nam’s T&T Group and Bouygues Group of France on cooperation in investment in the €1.4 billion (US$1.7 billion) urban railway project No. 3 connecting Ha Noi’s centre with it suburb town of Son Tay. On this occasion, Vietnamese Minister of Industry and Trade Tran Tuan Anh also handed an investment license to Son My 1 thermal power plant of France’s EDF Group.